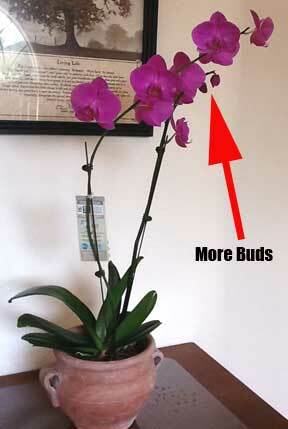 It started with the best of intentions… the problem is we found a Phalaenopsis orchid – she liked it better. So the moth orchid won out over the bromeliads. But, there are a few reasons the choice was made to go with the Phalaenopsis. Past experience has shown a plant with 2 to 3 buds still developing, (Moth orchid or Bromeliad) will give 4 months of bloom and indoor color. This means changing things out 3 times per year. Note: I purposely buy plants at the local garden center, so you and I deal with the same quality plants purchased. You should be able to get the same bloom times and longevity from your plants. The value of the plant was not just in the cost, which was $19.99. The plant value also came in the form of 2 plants in the pot, 2 bloom spikes with bloom buds still to open. This translates into future blooms and the value of 4 months of color indoors. Never would cut flowers last 4 months, nor would we expect it. (Buying Tip) It should be pointed out, there where other plants with attractive blooms, in the same price range, but they did not have more flowers to open. We like to mix things up a little during the year, using foliage plants and flowers like bromeliads and orchids allowing us to create simple, new looks. We’ll change out a plant and decorative container to “liven” things up… but we keep it simple. Don’t think this needs any explanation! Each week plant-care.com receives 100’s of plant questions. Answering each question takes time… you should see the backlog! If your question has gone unanswered… I Apologize! We will get to it. With thousands of articles, many times the answer can be found by doing a simple search. The search box is located in the top right hand corner of every page. At one time you could ask a question or make comments at the end of each article. You may have noticed we no longer allow questions or comments on articles. This is not because we do not want interaction, questions or feedback. It stems from “comment spammers” who automatically flood the comment section with garbage. Note: We stopped allowing comments on articles when each week 3,000 plus “comment spam” messages started arriving. Each comment, good or bad has to be individually approved or deleted. We tried to address the “ask a question” issue through our “Contact” form… which is not working on our end as it should. After much review, it was decided to “curate” and organize topics into “Tutorials or Guides”. These will basically be starting points, where many questions can be answered all in one place. The process has begun on “popular sections” – indoor plants, landscaping and lawn care. Starting next week, we will be asking you “What is Missing” from these guides, because we want your input. Changes are in the works to streamline the “Question Asking Process”, allowing us to process questions more efficiently and faster. This will include the ability for you to send an image along with your question. Please be patient as we continue to make these changes. The world of Social Media continues to grow and search engines are putting more emphasis on “signals” from Facebook, Twitter and Google +1. You now have the ability to “Like” on Facebook, “Tweet” on Twitter or +1 on Google. If you read an article you find helpful and worthy of: Liking, Tweeting or +1 – could you do that and give us some “love” on social media. Like it or not, social media is another area that must be addressed. Finally, This week I visited “The Landscape Show” in Orlando, Florida. Details for you next week!